It all started in the fall of 2011. After another summer -- our busiest season at Lawrence Public Library -- staff from Children’s, Teen, and Adult departments gathered to discuss how the summer reading program went. Good participation numbers? Check! Engaging slate of programs? Check! Lots of happy readers? Check! "We realized that, like the single theme, a unified, streamlined, all-ages approach could work for everything." This comment led to a weeks-long discussion about the marketing and promotional piece of summer reading. For years, like many libraries, we bought into the CSLP -- the Cooperative Summer Library Program. We liked how everything was pre-fabricated. The theme for the year was done, all of the graphics provided, and all of the incentives ready to hand out. But this was also exactly what we didn’t like about it. We were trying to figure out ways to make our marketing and branding what I termed “hyper-local.” The way we'd approached summer reading was easy, and the themes were good, but they did not speak to our community. We decided to re-think summer reading from top to bottom. The result: a totally local summer reading program that looks great, is easy to engage with, and is more successful than ever. The only reason we were able to do it was through supplemental funding. At LPL we have outstanding support from our Friends of the Library and also received a very generous grant from the Kansas Health Foundation. Traditionally, these combined funds (anywhere from $15,000 -- $25,000) go towards printing, programming, advertising, book giveaways, and grand prizes. For the first year of our new approach, we spent more money on a new graphic identity, but it is one that will be used for many years to come. It is because of these funds that our approach was possible, and the outcomes show that it has been money well-spent. It would reflect the Lawrence community. It would have a fresh and modern graphic look. The graphics would appeal to all ages. It would be unified and streamlined. It would be reusable and adaptable for several years. First, we hired a local graphic artist to design a new visual identity. She brought a modern graphic perspective and, even better, she was local, so she really understood our community. At the same time, we asked our staff to suggest possible names for the new program. 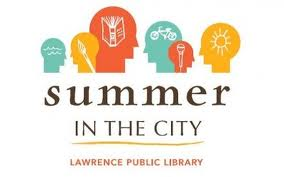 The head of our Circulation Department came up with the winning name, “Summer in the City.” It was familiar, thanks to the great song by the Lovin’ Spoonful, inviting people to spend their summer in Lawrence. Once we had the name and the artist was working on ideas, we started talking about nuts and bolts. How would this thing actually work? We knew wanted one theme to unite them all. Under the CLSP program, there were three themes – loosely related – for each age group of children, teens, and adults. We decided that one overall theme would engage all age groups and invite families to join together and participate in the same thematic program. Summer in the City would be it for everyone. But that left the question of reading logs and calendars and prizes and all of the things that make a summer reading tangible and fun. We realized that, like the single theme, a unified, streamlined, all-ages approach could work for everything. Instead of three different reading logs for age groups, we created one. Kids, teens, and adults had to read different amounts to finish, but they could do it all via one form. Instead of three different summer calendars of events, we created one that actually folded out into a big poster-sized piece – perfect for posting on the refrigerator for the whole family to check out. There would still be programs for all age groups, but we decided to make the programs even more hyper-local. We were trying to build our base of community partners, so we reached out to a variety of local organizations – Parks and Recreation, the local history museum, the Lawrence Arts Center – to partner up for programs that would reflect the city's spirit. That left the prizes. Each age group would still get a free book upon finishing. Kids and teens got to choose, but adults each got a copy of Winter’s Bone by Daniel Woodrell, the year’s Read Across Lawrence selection. This One Book/One Community program comes right on the heels of summer reading, so this made a great way to promote another of the library’s marquee programs. LPL has long included local merchants' coupons (for free ice cream, pizza, a free book at the Friends of the Library Book Sale) in the prize bags as well. But what about those bags? For years, each age group had gotten some kind of a bag upon finishing -- a symbol of finishing and a vessel for the other prizes. Kids and teens got a plastic bag and adults usually got a cute nylon or cloth tote. 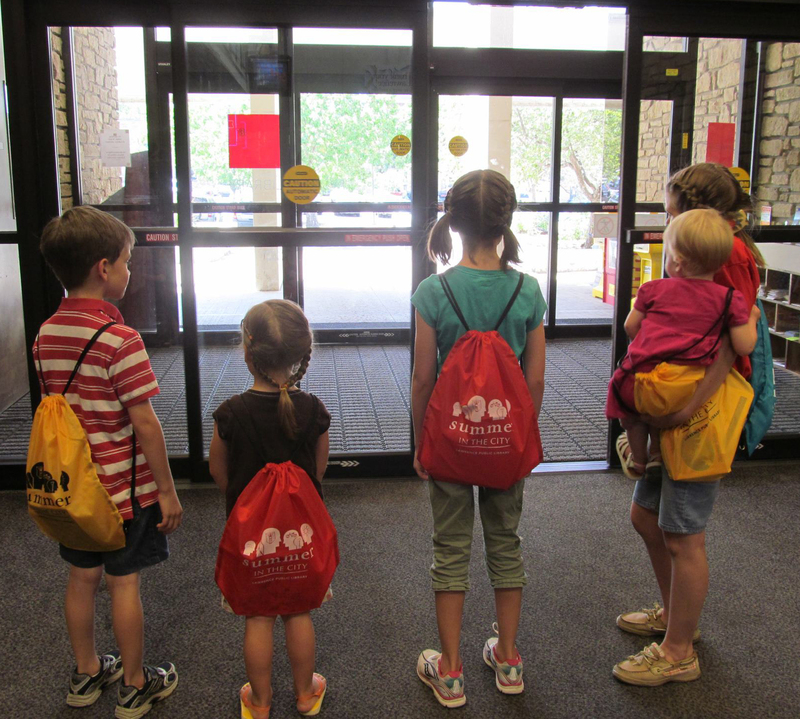 We all loved seeing the bags around town, we just wanted them to be identified with the library. And we wanted them to be so cool and summery that people would want to participate to get one! After poring through promotional catalogs, being mindful of our budget, and looking for something that would appeal across ages, we decided on a lightweight drawstring backpack and made it available in three colors that tied in the logo colors. Visual identity. The logo was meant to appeal to all ages, hence the different sized heads. Also, we wanted summer reading to go beyond reading with a nod to knowledge and learning and enrichment, hence the different symbols inside the heads. Our programming for the first year was loosely grouped into themes of reading, art, and physical activity and the symbols reflect those. For 2013, we had the graphic designer switch out a few of the symbols to give them a fresh take. Reading log and calendar. The response to the unified log and calendar was incredibly positive. Families that signed up together could take one calendar and multiple reading logs. Participants appreciated the one-stop shopping that the calendar allowed. 3. Prizes. The bags were a huge hit! We saw these bags at the pool, at the park, everywhere! They were bright, fun, and branded with our information. It was wonderful to see whole families walking out together with bags on their backs. Establishing a strong new visual identity for the program the first year was very important, so we made sure to use the logo everywhere – on the logs and calendars, on the bags, on in-house banners and posters distributed throughout town. We were so happy with the logo that we had t-shirts made for staff. We got so many compliments on the shirts that we printed more and sold them to the public, with the proceeds going back to support summer reading. We purchased a button maker and made buttons – some with the complete logo and some that just featured a particular head. Everyone loved the buttons and got to choose which symbol best represented them – the book, the bike, the lightbulb, etc. This rebranding project took a lot of time, money, and staff. Was it all worth it? Yes! It was worth every penny. The number of children’s finishers stayed about the same, but the two audiences targeted for growth definitely grew. The number of teens that participated in summer reading grew by just over 30% and the number of adult finishers increased by close to 50%. Were these numbers achieved because of the spiffy new logo? Maybe. Were these numbers realized because the whole program was streamlined, visually appealing to all ages, easier for families to participate together, and easier for staff to cross-promote? Most definitely. Susan Brown took her first library job to earn beer money while in college. After several years in academic and government libraries, she finally found her true calling behind the reference and readers' advisory desk at a public library. She has worked at libraries in Virginia, North Carolina, and Kansas and has her M.L.S. from the University of North Carolina at Chapel Hill. She is currently the Director at Chapel Hill Public Library in Chapel Hill, NC and is passionate about readers' services, social media, and marketing and merchandising for public libraries. Susan blogs about practical marketing for public libraries at 658.8 -- Practical Marketing for Public Libraries.